FILE - Facebook CEO Mark Zuckerberg speaks at Harvard University in Cambridge, Mass., May 25, 2017. 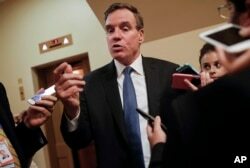 He says Russia's Internet Research Agency "has repeatedly acted to deceive people and manipulate people around the world, and we don't want them on Facebook anywhere." Facebook, expanding its response to people using the platform improperly, said Tuesday that it had deleted hundreds of Russian accounts and pages associated with a "troll factory" indicted by U.S. prosecutors for fake activist and political posts in the 2016 U.S. election campaign. 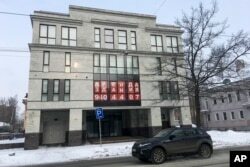 FILE - A view of the four-story building known as the "troll factory" in St. Petersburg, Russia, Feb. 17, 2018. "We're going to execute and operate under our principles," Zuckerberg said. "We don't allow people to have fake accounts, and if you repeatedly try to set up fake accounts to manipulate things, then our policy is to ban all of your accounts." FILE - An advertisement in The New York Times is displayed, March 25, 2018, in New York. 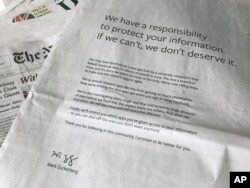 Facebook’s CEO apologized for the Cambridge Analytica scandal with ads in multiple U.S. and British newspapers. The 33-year-old billionaire plans to testify before U.S. lawmakers to explain Facebook's privacy policies, a first for him, a source said last week, although he has so far not committed to doing the same for U.K. lawmakers. Britain's data protection authority, the U.S. Federal Trade Commission and 37 U.S. state attorneys general are investigating Facebook's handling of personal data. Eventually, though, Facebook's security staff concluded that the social network was being used by spies and other government agents to covertly spread disinformation among rivals and enemies.